Home / News / Showbiz / Viral / Xander Ford Goes To Tulfo "Sinumbong Yung Mga Nambubully Sa Kanya"
Xander Ford Goes To Tulfo "Sinumbong Yung Mga Nambubully Sa Kanya"
It’s been weeks since the video of Marlou Arizala now Xander Ford calling Kathryn Bernardo “sakang” went viral. Few celebrities had expressed their reaction on the video where some indirectly addressed their disappointment towards Xander Ford. 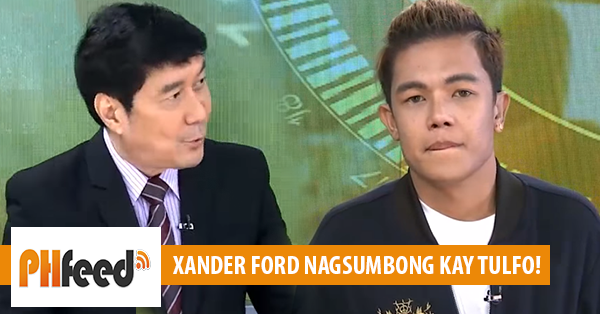 With the issue left hanging, Xander Ford broke his silence to clear the issue in Raffy Tulfo’s show. The said interview was uploaded yesterday and now gained more than 15K views. In the interview, Xander Ford got the opportunity to tell the story behind the viral video which he described as a ‘reaction video’. According to him, the said video was uploaded when he was still Marlou Arizala the time when he had no proper demeanor yet and blamed his behavior for being raised in a squatters area. Furthermore, Xander Ford said that he is very sorry and regretting what he had said about his ‘ate Kathryn’. If opportunity permits, he would be willing to kneel in front of her just to show his sincerest apology. Xander Ford also revealed that he also made a ‘reaction video’ about Nadine Lustre but it did not gain attention as much as his previous video about Kathryn. Also, the other reason why the online star went to the show of Raffy Tulfo was to seek the help of Raffy Tulfo to action the grave threats he is receiving. He confirmed that the threats came from netizens. He said that a lot of netizens want him dead and would even conduct an event to kill him. To further address the issue, Tulfo phone called Dave Alvarez, the guy who first uploaded the viral video of Xander Ford bullying Kathryn Bernardo. Alvarez falsified Xander Ford’s accusation that he also left grave threats to him as it was his first time to connect with Xander Ford after the video went viral. In the end, the two parties agreed to just end the issue with an apology coming from Xander Ford for the reason that he was on the wrong side when he was filmed bullying Kathryn Bernardo to think that he is now an Anti-Cyberbullying ambassador.